One hour before curtain, and my assistant, Tara, appeared to be a bit apprehensive. Knowing that I had given her a note for one of our show’s more difficult personalities, I asked her if everything was alright. “Yes, it’s alright,” she announced, “I just…” Her words broke off. And to be fair, I already knew. “You just have to find the tone that says ‘we want you to look your best,’” I bounced back at her. The note in question was one of timing. In Circus 1903, many of the transitions between acts and vignettes are timed to beautiful music composed by Evan Jolly and performed by the Prague Philharmonic Orchestra. It’s a rousing score, and the vast swath of lighting cues require the show caller to count complex numbers atop stanzas of 3-4 and 4-4, with a healthy dose of 6-8 for your soul. Additionally, one of the show’s larger visual effects requires synchronizing the cast and crew who are each pulling ropes with a countdown of “3, 2, 1 – GO” where each beat of the count actually represents 3 beats of a 6-8 measure (essentially counting 4 atop 6, as it were). In other words, timings are precise. Alexey was one of our newest cast members. Of course, his name wasn’t Alexey, no more than my assistant’s name is Tara, but let’s not let that ruin a good story. Alexey was hot-headed and quick to ignite. He frequently made arguments that made sense to him, but no one else. He wanted what he wanted, and he certainly didn’t want to be told what to do. I had worked with Alexey in Dubai and Abu Dhabi last year on a different project by the same producers. At that point, I was new to the company and still learning my political boundaries within the organization. “Don’t mind Alexey. He hurt his head,” one of the performers on that early show had told me. Indeed, Alexey had suffered a recent head trauma, and people were using it to justify almost everything about Alexey. Rude? Head Trauma. Walked off stage, skipping a bow? Head Trauma. Doesn’t like broccoli? Head Trauma! I don’t doubt that Alexey had something serious happen in his life. But I, too, know a hawk from a handsaw. There will be no standards if someone is allowed to not live up to them, head trauma or otherwise. Circus 1903 formed in Australia, and I led both its Australian National and US National tours. We had now moved to Las Vegas, where the show was taking up residency at the Paris Resort and Casino. When we moved from the tour, contracts were renewed, and some folks decided to head off to less sinful sunsets. Such is the entertainment world. Our originating artist, Michael, performed a similar act to Alexey, but took a contract which led him to Japan. Alexey was signed as a replacement and thus started the most unusual four months for my team. On the first day of rehearsal for the Las Vegas show, the full cast and crew were called at 9:00 am to a large warehouse in North Las Vegas. At 9:01 am, everyone was present except for one artist who had phoned to say they were lost, and, as fate would have it, Alexey. One of my interns called Alexey, only to wake him up at home. He reported that he had gotten the schedule, but thought he was called for 9:00 pm, as if all major Vegas shows started rehearsing at 3 hours until midnight. “Head Trauma,” people said. Right. Back in the office, Tara had decided to give Alexey a note via the show’s dance captain. This is certainly within the realm of artistic management, as it is also important for the dance captain to keep aware of problems within the show. The particular note was that Alexey was spending 30 seconds on stage in the background of a transition, only to arrive 2 seconds late to his apparatus downstage when it was time for his act. He needed to be on time with the music. In many people’s worlds, two seconds may not seem like much to act on – but when the music ends and the artist jumps up and poses two seconds later which also forces a lighting cue to either look early or be late, it looks sloppy. And it is frequently stage management’s job to effect change to correct that, whether directly to the artist or via notes to the dance captain. Tara met with the dance captain, who went to speak with Alexey right away about crossing downstage a couple of seconds earlier. I had gone away to check presets and release the house. When I returned a few minutes later, I found a rather sheepish dance captain and a very agitated Tara in the office. After refuting the dance captain, Alexey had made an appearance in the stage management office to tell Tara that he didn’t need notes from her and that it was his act – he wouldn’t have her “telling him what to do.” Perhaps you, too, know an Alexey in your SM world. The life of a General Stage Manager is filled with moments of discretion – moments where the producers share top-secret business elements, moments where the director confides that he doesn’t care for Artist X or the way she sings, and moments where multiple factors collide at once, such as an artist telling stage management that he isn’t listening and that he doesn’t care what stage management thinks, now approaching some 25 minutes before a performance. “Could I have a moment, Alexey?” I said through the open Men’s Dressing Room door. Certainly, this was no time for a public conversation. Alexey seemed agitated, but obliged and joined me in the hallway. “I don’t understand why I’m getting a note about something that’s two seconds difference.” He was visibly shaking with anger. I thought he might actually consider taking a swing over a variance of two seconds. Is this the way a professional receives and responds to notes? In that moment, I found it quite sad that someone had built their career in a way that left them so closed off to feedback, particularly from a show’s management. But in the end, I had to do what was best for the show. I went on to explain the difference that two seconds can make. It fell on deaf ears. Head trauma and all that jazz, perhaps. He chewed on that for what seemed like an hour. The fifteen-minute call could be heard on the speakers overhead. “Alright,” he finally mustered. “I’ll try it a couple of seconds earlier, but I don’t think it’s going to make a difference to anyone,” he half-heartedly offered. It was enough. His anger had been defused through reason, which is an important skill to pack away in your stage management kit. Tara and the dance captain both seemed a bit surprised when I told them that my chat went well. It’s understandable, as he looked just moments before like he might punch a hole in the wall. During that night’s performance, Alexey sauntered downstage just two seconds earlier than the previous couple of shows, hopped atop his apparatus and struck a pose as I called the lighting cue in anticipation of the final beat of the transition music. Much to his surprise, Alexey received entrance applause that night, perhaps reinforcing how we were helping him to look good. And Alexey never appeared late in that transition again. Terrence Williams is an international touring Production Stage Manager and Production Manager. 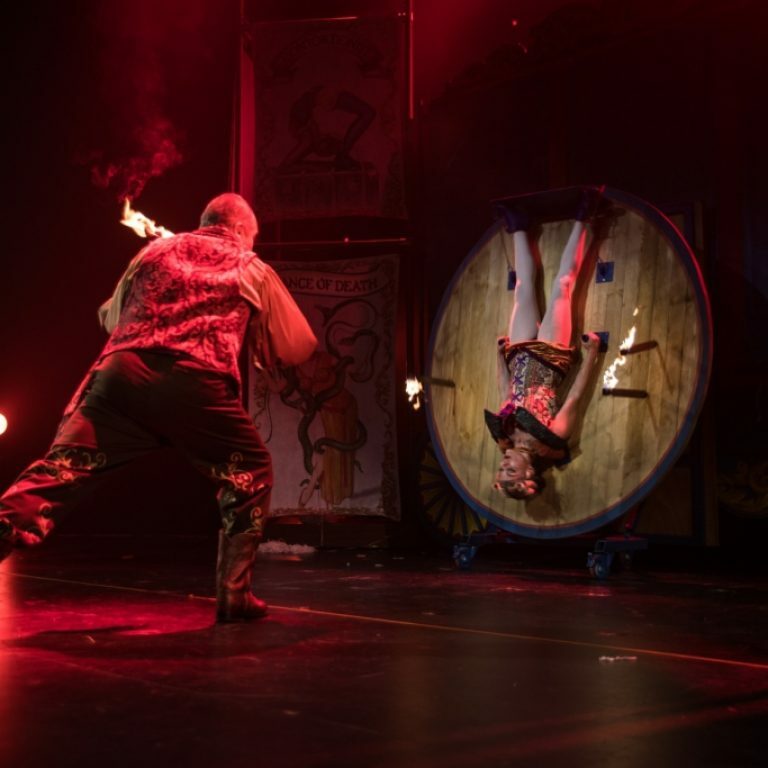 Terrence has helmed circus, magic and musical tours throughout North America, Asia Pacific and the Middle East. 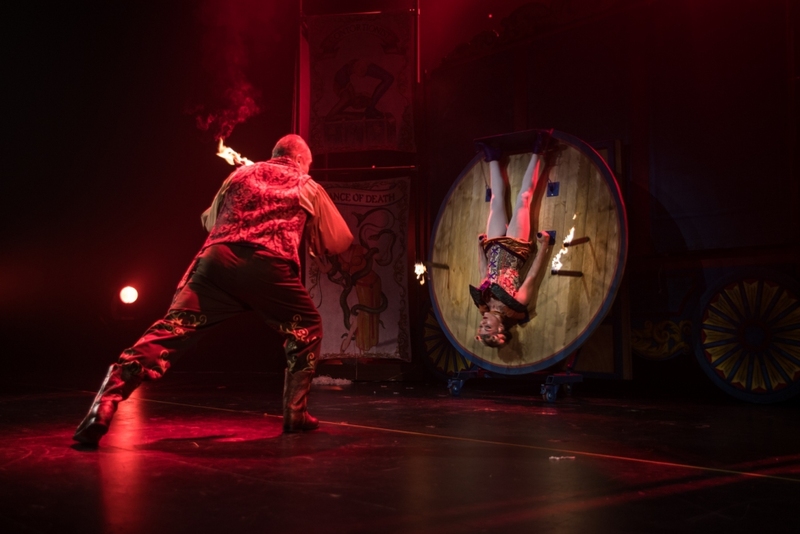 Current projects include The Illusionists, Circus 1903, and The Unbelievables.